Time-based release trains have been shown to produce the best quality Free software. A time based release is one that does not wait for either features, or bug fixes - but is based (as purely as possible) on time. This enforces discipline in introducing fixes, gives predictability, and allows more regular releasing. It is also the case that we will necessarily release earlier, and then rapidly, incrementally bug fix releases based on the previous stable version. Thus if you have a need for the very highest quality version, it can make sense to defer a move until the first or perhaps second minor point release. 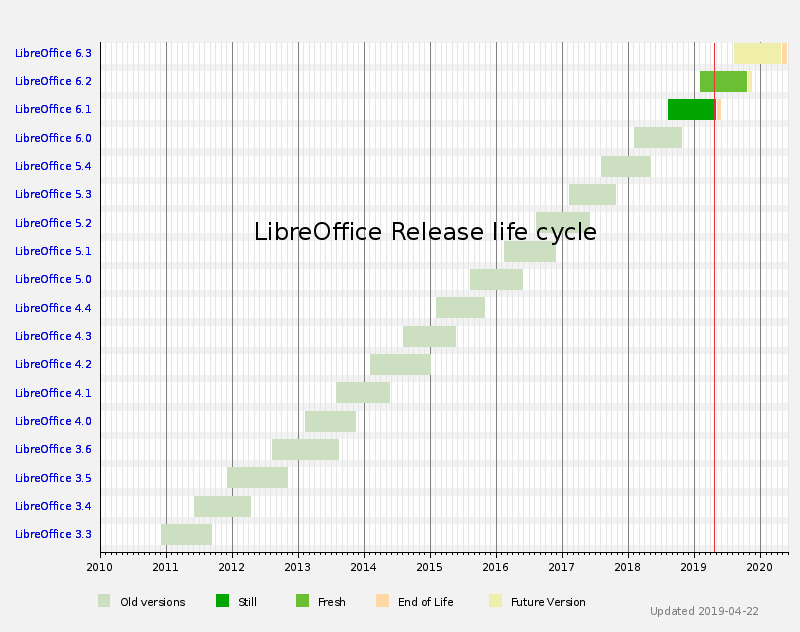 LibreOffice does bi-annual, predictable releases that are in sync with other Free Software projects (eg. Gnome) and are at least one month ahead major Linux distribution releases. Synchronizing time-based release schedule with the wider Free Software ecosystem also has huge advantages, by getting our new features, out to users as quickly as possible – with a minimum of distribution cycle lag. In consequence, we aim at six monthly releases, and over time nudge them to align well with the March/September norms. There are 2 branches: Fresh (the newest release) and Still (the previous release), which are intended for mainstream feature users and conservative, corporate deployments respectively. As a result, users get new major version every six months with a wide range of features, fixes, and enhancements. In addition, they get many pure bugfix micro releases. The first X.Y.0 release is intended for early adopters. More conservative users are advised to wait for a later X.Y.Z bugfix release. Note that the dates mentioned in the schedule might get shifted if there are serious technical or other problems with the release. An extra RC might be needed if the final release candidate does not fit the Release Criteria. Such problem would shift the final release by one week or even more. See also the detailed schedule and the release notes. The release is time-based but the schedule defines calendar weeks instead of exact dates. It is because we are always a bit flexible. The release can be delayed by few days because of blocker bugs, build problems, and other technical issues. Friday: builds are available via the official pre-release site. The final release is usually announced on Thursday, few days after the final release candidate is out. Note that we are very strict about commits to the final release candidate, so full regression test is not needed. It is used as the final build when it passes the needed tests. It is just renamed on mirrors. do not do two builds the same week. Where (b) means the beginning of the month, (m) means the middle of the month and (e) means the end of the month. X.Y.1.Z - Zth release candidate of the 1st bugfix release, last rc is considered as final and put on the main download page. “easy” to parse (alpha/beta strings delimited by dot). There was a long discussion about this scheme on the mailing list. This acceleration of the release cycle involves some considerable release engineering and QA effort. To reduce the cost of these, we work to provide complete (ie. containing all languages) daily snapshots of the master branch to allow continual testing of code improvements. This works partially already, as can be seen/downloaded from here. Similarly, we plan to increasingly automate the build process to allow a much lower-touch release flow, and to continue to shrink the footprint of our binaries to allow far more rapid transfer of product-equivalent builds. A release normally has a lifetime of around nine months. We consider a release to have reached its End of Life (EOL) one month after the last planned release. If you want longer term support for a release, you’re encouraged to engage any certified L3 provider who could provide you with the service. Because of the amount of data, the releases were split out to ReleasePlan/Archive. This page was last edited 14:28:45, 2019-02-21 by Christian Lohmaier. Based on work by Ilmari Lauhakangas and Xisco Fauli and others.